Customer support is always one of the best ways to keep the customers happy after a sale is done from your side. The customers can”t be left with an endless number of tries to reach the company and failing every time. One of the best customer support services and solutions we have found lately is Hesk, which gives a bunch of options for the company to set up the ticket system, for the users to get in touch easily with the company. One of the best advantages for the website / company owners is that you don”t have any hidden features that lack in the free version, and you need to pay only to remove the link to the original script developer, so the ones who don”t have a problem with the link can settle without paying for the usage of Hesk. The front-end of Hesk looks the simplest, and easiest-to-use for the person who is trying to create a complaint ticket or trying to contact the company. Similarly, the backend is easy-to-use with multiple options and options to provide multiple accounts so that the staff of the company too can manage the tickets, and there is no limited access to any user. Many a times, there are a few things which are pretty basic but the users don”t find the same on the direct view, and that”s where they can save their time by searching and learning through the Knowledgebase rather than keep waiting for the representatives of the company to be online and answer the same simple question which you had in mind, and the answer for which was available in the Knowledgebase. This is how an example ticket appears on a website for the users to get help from the customer support of any company or service. Let”s check out what Hesk has provided for both the parties – The Company staff, The Customer. Unlimited Accounts – Users get the knowledge on who they had a chat with, regarding any issue, be it a simple question or a complex multi step question which was solved or pending by the Customer. Restricted access to some functionalities for certain staff – There are certain aspects of the interface which have the option to be restricted to some of your support staff, be it Reports, staff tickets, or managing the tickets of staff. 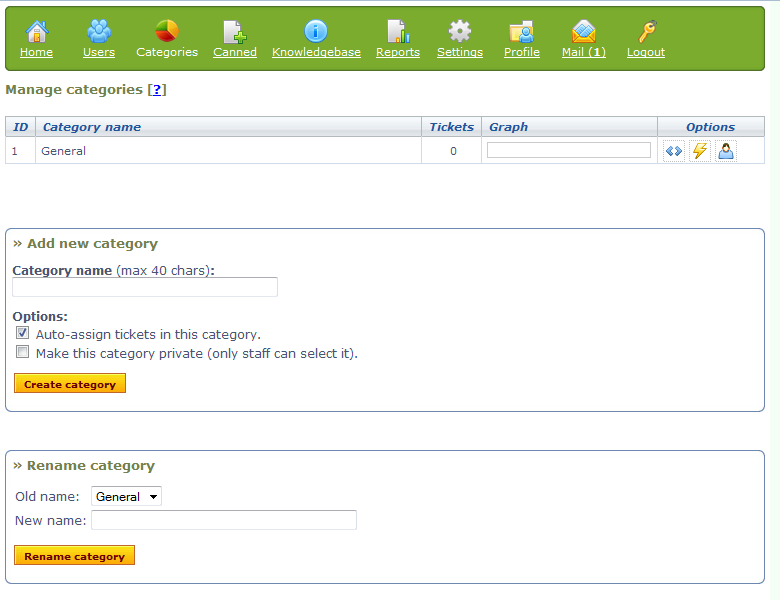 Powerful ticket search ability: This is a very useful option which allows the staff to search for a past ticket which might be similar to the present ticket submitted by the user. Which will make ti very easy to solve the problem by referring to the past ticket. 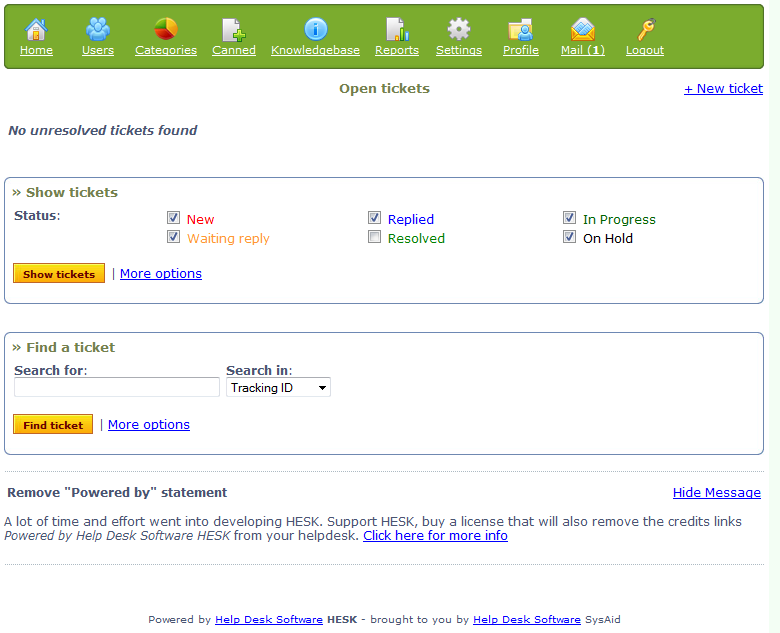 Assign tickets to staff: Assigning tickets is an easy process with this assigning system from hesk which allows you to easilyAssign tickets to staff depending on criteria. 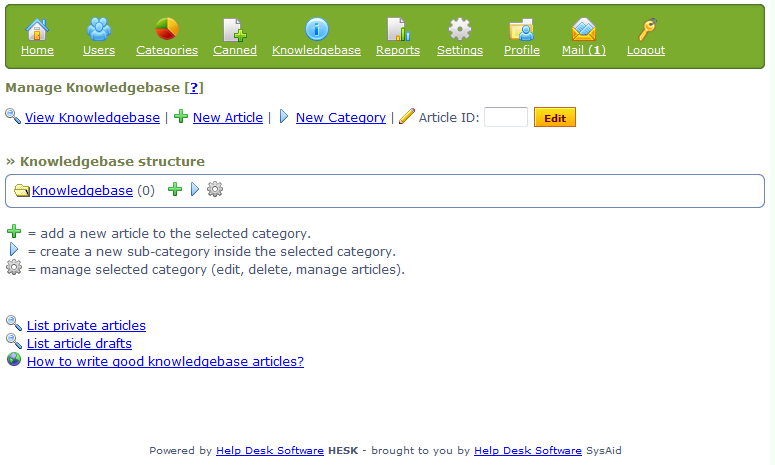 Manage knowledgebase categories and articles: A simple interface to manage the knowledgebase which is the most important part of the helpdesk which allows users to solve their problems by looking at examples. Categories and Articles are also aligned nicely in a user friendly manner. 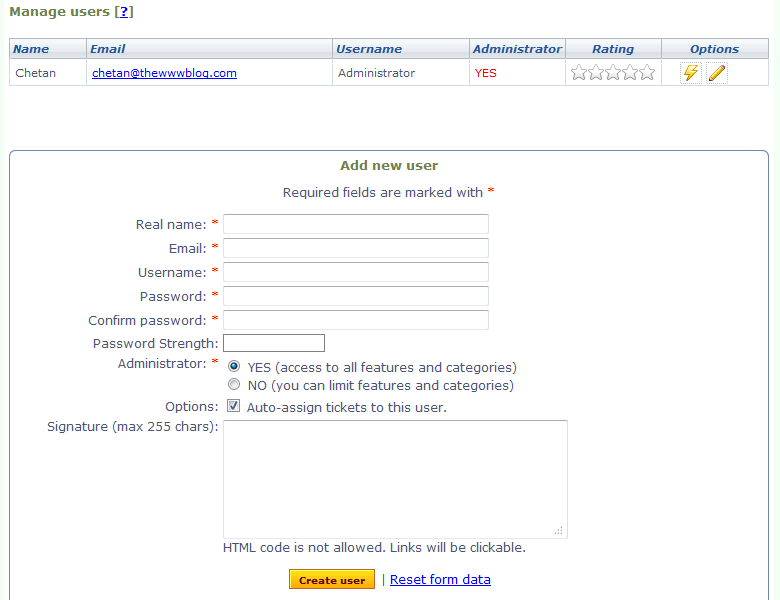 Manage staff accounts: Staff accounts can be managed easily to rank your staff according to ratings and the work they have done and also to implementing restrictions to certain staff accounts. 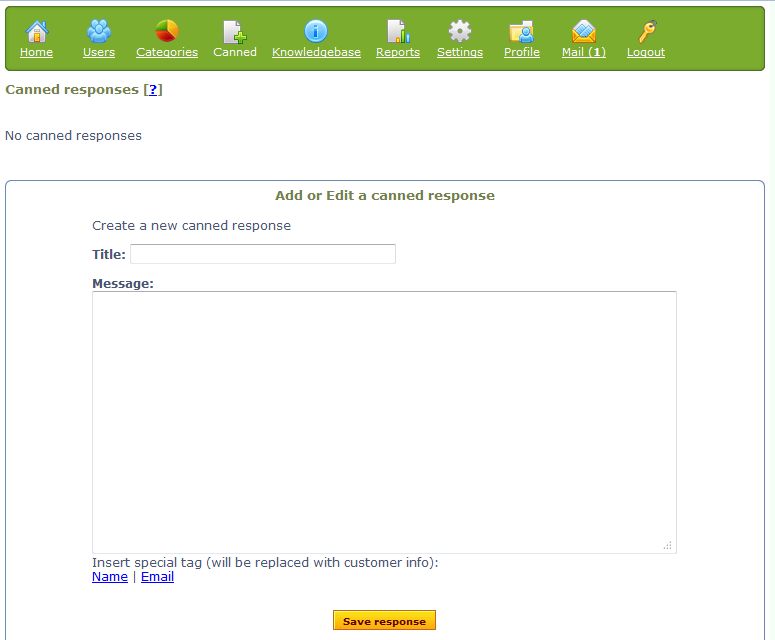 Canned responses (pre-written replies): These are a list of answers written before hand for certain common queries which can be given directly by the staff. Customize help desk settings: Help desk settings can be easily customized suited to your requirements and the way you think will be helpful for your customers. Track time worked on a ticket: Time tracker is also a very important feature to assess the efficiency of the staff and also the type of questions which is taking more time to solve. Auto close tickets after X days: Options to close unresolved tickets after a certain number of days is useful to decrease the number of tickets. 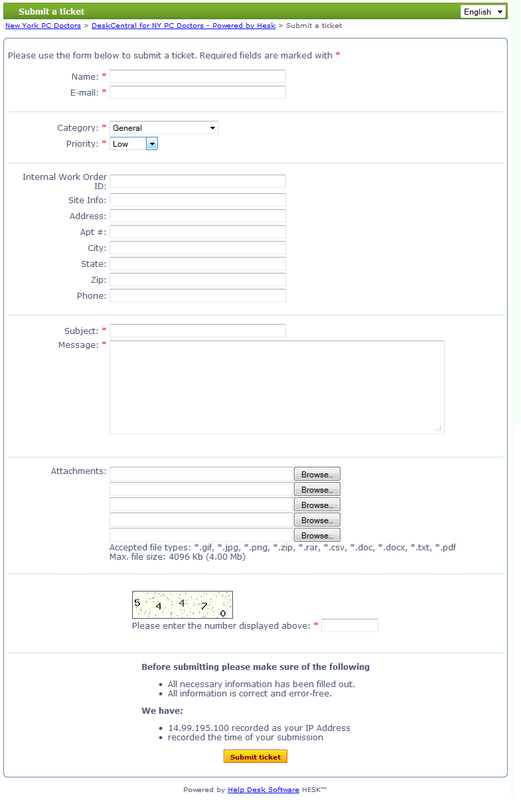 Submit new tickets (web form or email piping/POP3 fetching): It is very user friendly to submit a ticket which will finish in 3 easy steps. 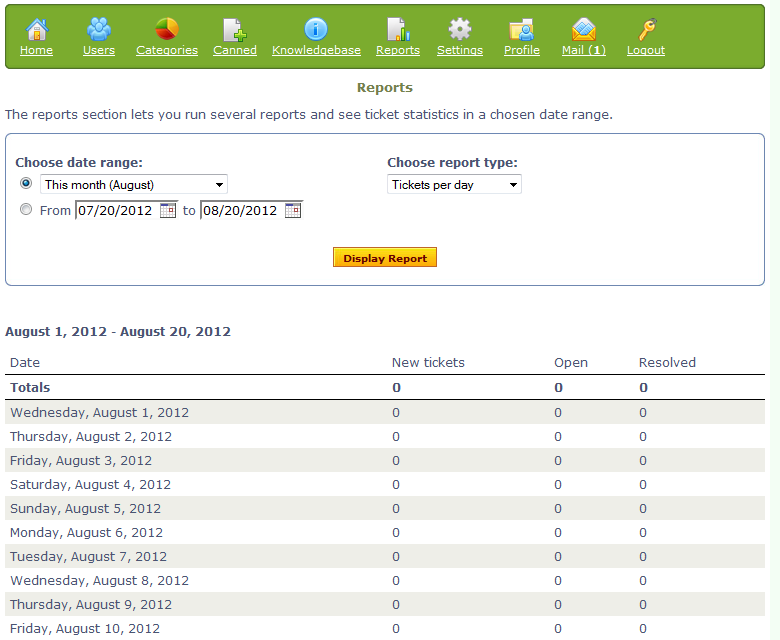 The best user interface of the help desk platforms available in the market. Attach files: You can even attach files like screenshots to help potray your problem easily. This is one of a kind feature making it apart and giving it a upper hand over others. Suggest related knowledgebase articles before final ticket submission: The users are suggested with articles from the knowledgebase which are related to the ticket the users are submitting which is a very useful tool to help the users before submitting the ticket and also making it easier for both the user and the staff. View and rate staff replies: Users can rate staff replies based on their quality and help both future users and also the staff to assess the quality of the staff. E-mail notifications of staff replies: If you have submitted a ticket and cannot wait for the staff to reply you can activate E-mail notifications which will let you get the email when staff has replied and act accordingly afterwards in your free time. Browse and search knowledgebase: Knowledgebase which is the section where you can see the most frequently asked queries and the answers to those queries, most of the issues can be resolved by referring to knowledgebase without going into chat with the staff. Hesk.com is Help desk software which is really helpful in providing good after sales service to your business which is the main criteria of making your business everlasting is the after sales service which will be the difference between similar companies and yours. You can have a Demo of Customer Interface, Knowledge base and Administrator and Staff interface in Hesk.com to get a good experience of what you are going to work with in the future and whether or not is suites your requirements. With Hesk.com which is also available in free as well as paid licensed version is available at UD $39.95. You can Try the Online helpdesk Demo Link which is available at the base of the homepage, before purchasing or downloading the actual software for your company. Installation is pretty easy in the free version where you will be getting the step by step instruction to do it. Where you have to provide the URL onto which you want HESK to be installed after which you will have to give in the Server login information namely FTP username, address and password. For a normal installation which takes upto 3 business day the cost is US $19.95 and for a Urgent installation which takes 1 business day the cost is US $29.95. Single website license is available at US $39.95 which allows the installation only for a single website. And if you take the Developers License it is available at US $199.95 which can be used for 10 Websites. Hesk.com accepts payments from all major credit cards through Checkout and also accepts Paypal.